The backstory was revealed in this episode of Inkaar and Rehan Chaudhry’s character was finally introduced. The overall treatment given to this play is relatively slow and so far Hajra’s character is the most appealing aspect of every episode. Hajra’s relationship with her father has to be the most endearing part of every episode yet their relationship has not been given a lot of screen time. The viewers saw a more ‘soft’ side of Hajra’s character in this episode. She finally came out of her shell and the backstory showed that there was a time when she was not as cold as she is now. Hajra has been introduced as an intelligent girl who has certain principles. The way Rehan Chaudhry won her over was the most convincing part of this episode. The writer did not leave anything to the viewer’s imagination. Hajra’s dialogues about how Rehan made her feel respected and special were right on point since they helped the viewers understand why a girl like her fell for someone like him. Imran Ashraf translated his character flawlessly on screen and Yumna Zaidi gave a solid performance throughout. You definitely wanted to know more about this track when the episode ended. Did Hajra manage to run away? Imran Ashraf and Yumna Zaidi both are the kind of actors who convey a great deal about their characters through their body language and expressions. Watching them in the same frame was nothing short of a treat even though some of these scenes were not executed impressively. The backstory covered how Rehan Chaudhry refused to take no for an answer and did whatever he could to make Hajra trust him. The only reason why he pampered Hajra and made her feel like a chaudhren was because he wanted her to be completely blinded by her love for him. Hajra’s reaction when she found out what Rehan’s actual intentions were, went to show that she was a strong girl who wouldn’t give up or give in easily. Hajra chose to tell Shayan everything about her past and I am wondering if all these tracks somehow are interlinked in more ways than one. Haseeb Khan (the professor who harassed Hajra) is clearly being typecast since his role in Ranjha Ranjha Kardi was quite similar to the one he played tonight. I am seriously disappointed with the makeovers in general and the overall feel of this play since so far it seems like this script could have been given a less artsy and more commercial treatment. The pace of the drama so far is quite slow, the visuals are somewhat dull but the story is intriguing. The social commentary tonight gave an insight into Hajra’s character and the atmosphere in her house. I am waiting to find out more about Shayan’s character. Is he really as ‘perfect’ as he seems? 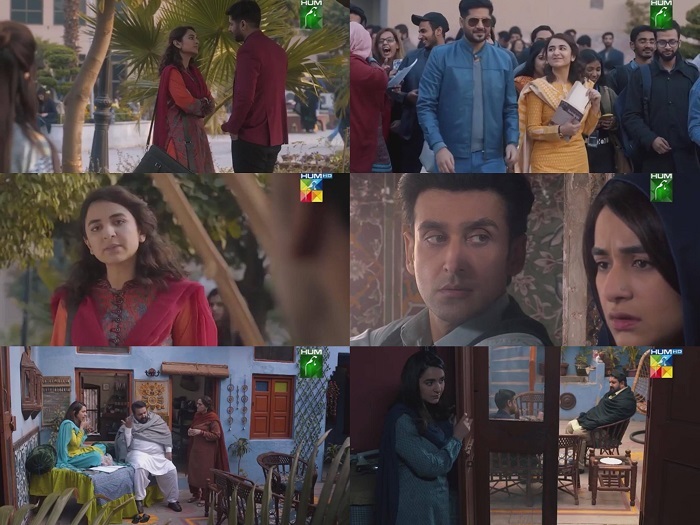 The preview of the next episode suggested that Shayan will be more than willing to love and accept Hajra even after finding out what she went through in the past. The story should get more interesting once and if Rehan Chaudhry is also a part of it in the present-day.